It's happened again - I am running so late with my Toolbox eNews Update - I guess I will just have to peddle harder. My apologies if this has inconvenienced anyone. Trends in multiple time frames - One of the important things to understand about price trends, and looking for an uptrend to follow (because it is reported that the trend is your friend) is that a price trend can exist within a trend, and the two trends can be different. For instance, an uptrend can exist within a bigger downtrend, and if you want to invest with the uptrend in the hope that it will continue, you might be surprised if it stops short and the earlier downtrend continues. A good example of exactly this situation is shown in the chart here (click on the image for a larger version). For more details about this, and the new web page and new eBook (PDF) Article, see all the details in this edition's focus section below. Please remember, anything mentioned here, and in the referred eBook Articles, or web pages, is for general education only, and is not advice of any sort. Here's a short note to the recently new Toolbox Members, and new readers of this eNews email:- These share market Toolbox eNews emails always go to Toolbox Members (a part of the Toolbox service), and to the people who have registered to receive occasional information about the Share Market. This is a bi-monthly email (or sometimes monthly) with some pointers and tips on focused topics - see a quick intro to the eNews emails. They often include references to specific eBook Articles in my Share Market Toolbox, as well as key web pages in the free area of the Toolbox (eg. on the extensive Share Market web page). I have been writing the eBook Articles since October 2008 - that's a few years now - and these eNews emails help you to navigate to related and useful information each month. You can see the past eNews emails in the eNews Archive. Many traders and investors are able to readily spot a price trend on a price chart - either an uptrend or a downtrend, and many also believe that once a trend is in place it is likely to continue. This is basically because of the underlying opinions of the market participants (this is explained on my Share Market Toolbox Technical Analysis introduction page). 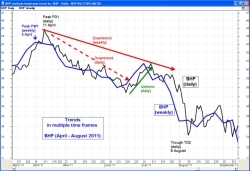 Trends in multiple time frames. However, there is a complication. A price trend can exist within a price trend, and these two trends can be opposite. A good example of this is shown in the accompanying price chart (click on the chart for a larger image). 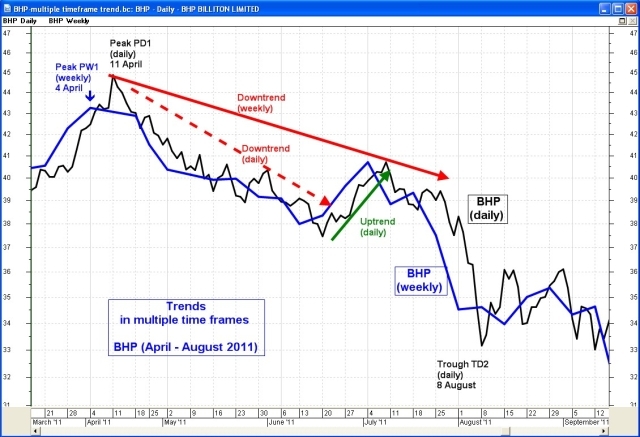 In this example, a major downtrend was under way for the first half of the chart, then an uptrend got under way. After a few weeks, the earlier downtrend continued. It is so important to be able to spot these features on the price charts, and then don't be surprised when the price action unfolds - whatever might happen. eBook Article TA-3200, "Trends - Introduction". This existing article is freely available. eBook Article TA-3205, "Trends and Trendlines", an existing 5 page Article exclusively for Toolbox members. eBook Article TA-3210, "Trends - Primary and Secondary Trends", an existing 4 page Article exclusively for Toolbox members. eBook Article TA-3220, "Trend strength", an existing 7 page Article exclusively for Toolbox members. Web page - Price trends in multiple time frames (for Toolbox Members only). eBook Article TA-3230, "Trends in multiple time frames" - This 6-page eBook article is new, and expands on the earlier ones listed above. Non-members can see the free page 1 here.